I’ve decided to rekindle my photographic eye by taking black & white images through a 24mm wide angle prime lens. That was basically the rig I learned that basics of exposure and lighting doing. I had a trusty Nikon FE2 35mm film camera with a 24mm wide angle on it. I used other lenses, but that was the rig that I used most. I still have it and it feels like comfort in my hands. I don’t use it because film is basically gone. I miss film and I don’t miss it. In my darkroom film was messy and smelly and chemically. There was so much waste product just to get to the print you wanted. All of that waste cost money. Throw away paper, film and chemicals. Modern digital sensors with massive memory cards and great software for photo processing allow for fantastic image creation and are more environmentally friendly. I now have a Nikon D700, a pro level digital camera, and recently picked up a nice 24mm autofocus lens at a reasonable price. There is something about that degree of wide angle which makes you think about what you are shooting. And the fact that it is a prime lens, meaning it only has one focal length, you have to physically move to get the frame right. That means you have to think about composition and look with a wide angle frame of reference. As I started to take shots I realized that advanced technology was getting in my way. You see, taking a good B&W image with film required understanding where the darks and lights were in relation to each other and adjusting the exposure accordingly. There is a system developed by Ansel Adams called ‘The Zone System’ and it provides a way of metering parts of the image and then, based on the tonal range of the image, adjusting the exposure and development. The reason this was so important is because the actual luminance has a range that is much greater than what film can record. The Zone System allowed you to expose and image and develop it in a way that compressed the range and gave you an accurate representation of what you visualized. It is one of the reasons Ansel’s images are so deep and rich. To do the exposure correctly you need a good light meter. Yes, the metering systems on modern cameras are phenomenal. But they are geared for color images. 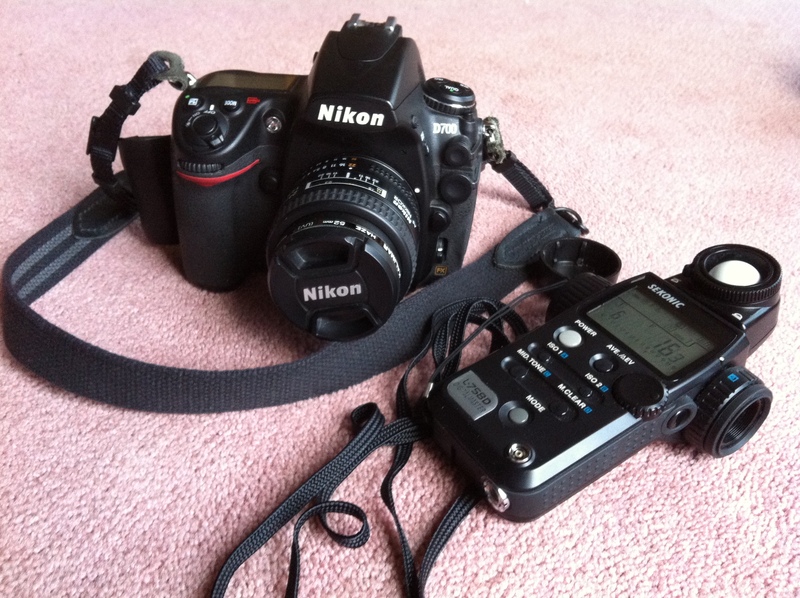 IN the above image, the device sitting next to my D700 is a Sekonic light meter. I use it for flash and normal light exposures when I want great accuracy. It is a one degree spot meter, so I can take a reading off of a very small part of the image. It’s a decent shot. I mean as far as the exposure goes. I wasn’t composing anything artistic. I was trying to prove a point. Now, using the zone system, I measured the Kindle’s cover and placed that luminance at a lower range along the grey scale. It should look black, not dark grey. All light meters measure in a way that the exposure they provide will average out to an 18% grey scale. 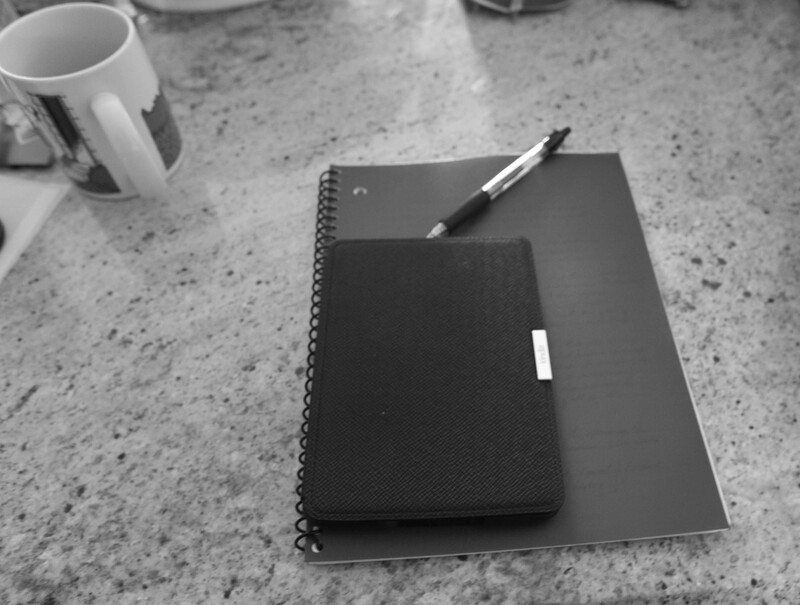 Which is about where the blue spiral notebook is in the above shot. 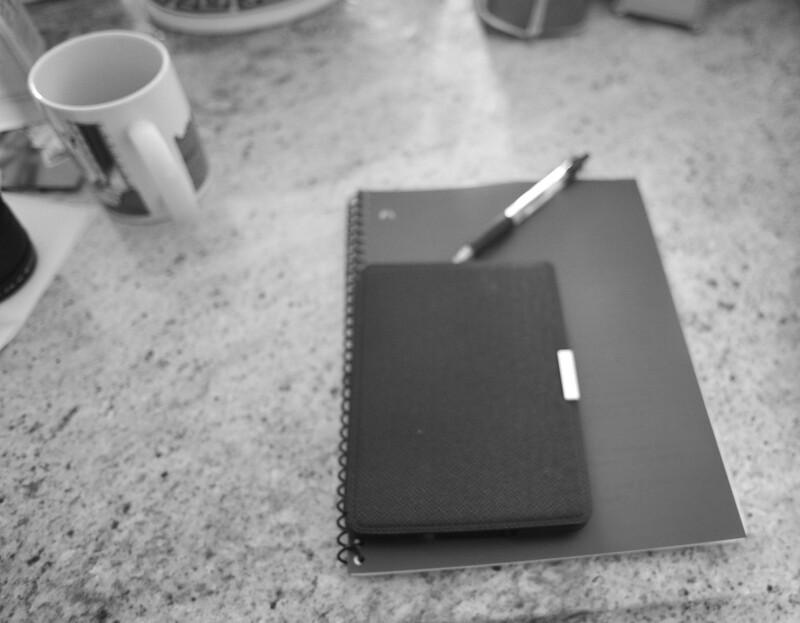 Because your mind is good at adjusting, you “know” from this shot that the Kindle is black, even though it shows up as a dark grey. It is a subtle difference, but now you really see that the cover is black and that it has a deep texture. You also pick up a little more texture in the marble and coffee cup. It is a much more realistic interpretation of what I pre-visualized. Now you know why Ansel Adams art was so appealing. I am a technologist. I have been most of my adult life. My income stems from my ability to see where technology is going and to make progress in bringing it to fruition. I have such great appreciation for the disruptive effect of technology and how that disruption breeds new opportunities, if you are willing to take some risk. The trouble is, that layers of technology can obscure some basic understanding. Recording light on film or through digital sensors works a certain way. Our technology doesn’t change that. In this instant it seems like technology tries to take our intellect out of the picture. It stems from making it convenient, but what is the cost? Over the past few days I’ve had to stretch my sense of perception again, waking up old synapses that understood how to shift and move apertures and shutter speeds. The end result is I feel part of the pictures I am taking. I feel more like I can express what I am trying to visualize, not just snap a shot. I compose. I think about the light. I place reflectivity where I want it to be. I fail a lot, but when I succeed, the image is what I envisioned. My point is that a broad application of technology is not always good. There are times, like with my computer assisted hip replacement, when technology has massive benefits. There are other times when technology insulates us from understanding and feeling more. Technical running shoes seem a good example of that. They eliminate the feel of the ground under our feet and shunt the muscle development in our feet leading to numerous biomechanical issues that we then throw even more technology at. There is a similar issue in writing. Advanced publishing software and digital book services allow anyone who can type into a computer to publish an e-book. That is a great thing, except many writers forego the process of having their work edited for content and format. Getting that critical feedback and incorporating the feedback into their work is what makes a good author a great author. Not all feedback is correct, but all feedback makes you think about what you have done and what you have said. Don’t forget the basics, regardless of how easy it is to create the content. Would I eliminate the advanced light meter on my D700? Absolutely not. But I spend time understanding why it works and where its limits are. Afterall, I can switch to manual mode anytime and override the programmed exposure. I often do, but I can do it because I understand light. I understand the basis for why photography works. Don’t just accept technology. Ask why. Dig underneath the covers. Understanding is freedom. Few things are ever just black and white.